Question: What is the difference between a labyrinth and a maze? Answer: A maze is for fun, a game with lots of pathways and blind alleys for getting lost in, whereas a labyrinth is a spiritual experience with one pathway in and one pathway out, and can help you find yourself. Before about 1400 BC, in Greek mythology, Daedalus built a labyrinth/maze in which to hold the Minotaur, a creature that was half man and half bull. 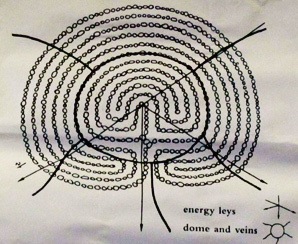 Many forms of the labyrinth appeared in ancient Greece, Egypt and other parts of the world. Excitingly, we have one locally, in Troytown near Slimbridge. 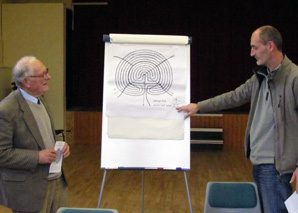 The name, which seems to have roots in Greek mythology, alerted our speaker and Chairman, Peter Golding, to its existence some years ago, as the word ‘Troy’ in a place name usually means there was or is a turf maze or labyrinth to be found there. On investigation, there was no physical evidence of anything whatsoever, but by map dowsing with his pendulum, Peter established its position in a field beside ancient footpaths. He then visited the site with his dowsing rods and discovered that the energy was still very much in evidence. His rods indicated that this labyrinth was last used in the 1920s and was probably first placed there in the 1500s. Peter was so excited by his discovery, he was invited to talk about it to the Slimbridge Local History Society in March 2003. There was so much interest that, as a direct result of that meeting, the Slimbridge Dowsing Group was formed the following June. It began with just eight people and we now have almost 40 members. Speaker and Chairman Peter Golding clarifies a point for Jon Martin, SDG member. Originally the labyrinthine shape would have been laid out on the ground with turf or stones. If you walk the seven paths leading in, meditating as you go, reaching the centre can be a truly uplifting experience. You then leave by the same seven pathways and as you exit, you turn and give thanks, even though you may not know to whom. This energy still works to this day and enthusiasts can build their own in the garden; one was seen at the Spring Gardening Show at Malvern’s Three Counties Showground recently. Dowsing frequently indicates there is water in the centre, but this may well be mere resonance, not water at all. It also appears to be of 100% purity, which qualifies it as holy water. Severn Trent please take note! Various theories for its original purpose have been put forward. The focused energy seems to provide the spiritually uplifting experience of sacred space. Another possibility is that people may have placed their grain and seeds in the centre in order to improve crop yield when planted. This has been proved to work in the 21st century, and in pyramids as well. Our forebears were highly preoccupied with sacred geometry, and Chartres Cathedral in France has a magnificent labyrinth dating from about 1225 AD, a copy of which appears in Gloucester Cathedral annually. Why not visit next time it appears? Enjoy the experience which, we are confident, will simply raise more questions than answers. Our first meeting in the New Year will be at 2.00pm on Thursday 13 January when three of our wise men will hold a Forum on Dowsing Questioning Skills. Dowsing rods can only answer ‘Yes’ or ‘No’ so you have to phrase your questions carefully.